TGUI 0.7.3 has been released. Because 0.8 is still going to be in development for a long time, I decided to make the creation of widgets slightly easier in 0.7. There are now static create functions similar to the ones in 0.8-dev (although in 0.7 they are only needed when not using a theme, in 0.8-dev themes are handled differently and you always create widgets like this). TGUI 0.8.0 has been released! An experimental gui builder has been added (again, since the form builder used to exist in early TGUI versions but was removed in 0.7 as the API wasn't stable enough yet to maintain it). This time it should be here to stay. I should really give it try sometime. Awesome, texus. I'm really glad to see 0.8dev become the main branch! 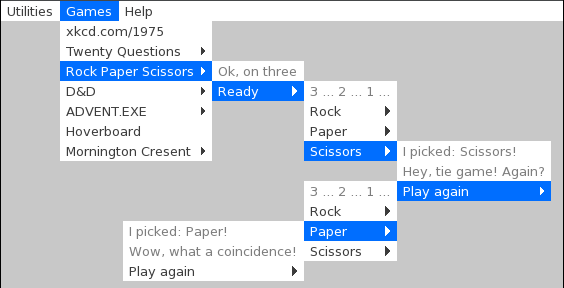 I've been away from TGUI for a while but always come back to it when I have interface needs! So when is 0.9dev branch opening? There shouldn't be a 0.9-dev branch for quite a while. Usually by the time a new branch becomes stable, I already planned to rewrite certain parts in the next version or I even already started development of the new version locally. This is not the case this time. New features should still be added to 0.8 as long as possible. I'm currently not spending a lot of time programming, only when bugfixes need to be made, so there may not be any really big changes in the near future for 0.8 either. MenuBar got support for submenus and for disabling menu items. A new TreeView widget was added. Changing the text styles in the ChatBox widget also became possible. TGUI 0.8.3 brought several new features, the biggest one being the ListView which has been the most requested widget for quite a while. 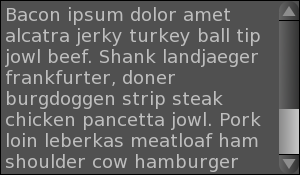 Label also got a vertical scrollbar, TextBox got the option to use a horizontal scrollbar (as alternative to the default word-wrapping) and EditBox got the ability to set a fixed suffix behind the string (e.g. for displaying units). Currently there are no plans yet for what will be added in 0.8.4, it could be another release bringing new features but it could also be the start of a period with mostly bugfixes. 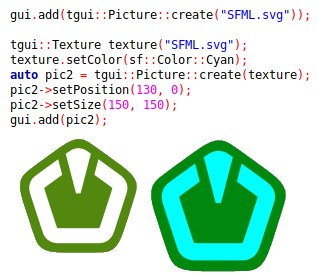 The changes made in the last patch releases make it clear that TGUI isn't following SemVer, that however doesn't mean that I don't care about compatibility. 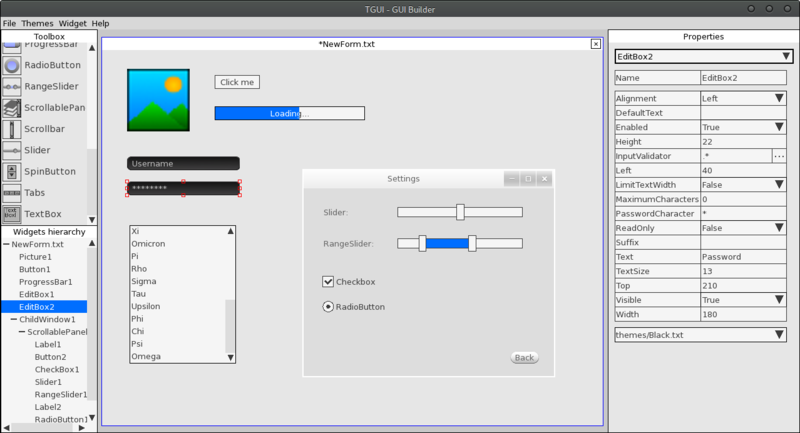 The TGUI 0.8.x branch will continue to be backwards compatible with earlier TGUI 0.8.x releases, but an exception to this rule is being added. Since neither the TreeView nor the ListView class received any feedback or testing during development other than my own tests, I do not want to guarantee 100% API stability for these classes. I will however still try to keep things compatible for these two widgets. Nice to see all the progress! What do you mean with adding all the gauges? The gui builder still needs a lot of work, it has been neglected a bit since it was released. This might be something that I could improve in the next version. What I was talking about is just how to add widgets in the gui builder itself. 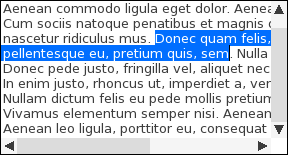 As an example I need to add the TABS widget, what are the files that need to update in the guibuilder project? The biggest work would be creating a new TabsProperties.hpp file inside the "include" directory (the one inside the "gui-builder" directory obviously). You can have a look at other widgets (e.g. "ListBoxProperties.hpp") for examples on how this file should look. The properties needed in "updateProperty" can be found in the Tabs::load function from src/TGUI/Widgets/Tabs.cpp while the properties in the "initProperties" function also include the ones found in the Tabs::rendererChanged function. - You also need to add a file called "Tabs.png" to the resources/widget-icons folder. TGUI 0.8.5 has been released.